﻿Summer is here! Summer is here! Summer is here! I may be speaking too soon but I think it’s safe to strip off the rain gear and break out the flip flops and shorts. There’s lots going on this month to enjoy and get involved with. The Tofino Food and Wine Festival celebrates their 9th year, and welcome wineries from around BC with our west coast chefs, to join them in creating a gastronomical affair, June 2 - 5, 2011. Meet winemakers from the Okanagan, Kootenays, Vancouver Island and Gulf Islands. Featuring gourmet food made with love, using the finest ingredients from Vancouver Island, with local farmers and purveyors to discover, including Hilary’s Fine Cheese, Moonstruck Cheese, Natural Pastures Cheese, Outlandish Shellfish, Evening Cove Oysters, Medicine Farm and more. Events of the festival support several nonprofit organizations and initiatives, including Tofino Botanical Gardens Foundation, Lighthouse Trail, Multi Use Path (MUP), Community Children’s Centre and Tofino’s Community Garden. Central Westcoast Forest Society is a local charitable non-profit based on the west coast of Vancouver Island. CWFS focuses on salmon habitat restoration and enhancement, research and education and the development of recreational and educational opportunities and infrastructure on Vancouver Island. On June 10, 2011, Central Westcoast Forest Society will be hosting the Salmon to Sea Oceanside Fundraiser and silent auction at Black Rock Resort in Ucluelet. Acclaimed folk/blue grass artist Oliver Swain will be performing from 8:00 till late. All of the funds raised from this event will be used to support salmon habitat restoration in Clayoquot Sound. Doors open at 8pm. Tickets are $35 and include tapas and drinks, get your tickets at Surf Sister and Wild Heather Books. Please join us and help restore the health and vitality of streams and rivers. Since 2004, Tofino Streamkeepers have been helping to keep the streams in Tofino and Clayoquot Sound healthy and productive through restoration, conservation and education. Tofino Streamkeepers is a local, non-profit organisation, run by a volunteer board of directors. On Saturday June 18, we will be hosting our first ever Fundraiser Event. We would like you, your friends, and your family to join us for a night of music and silent auction at the Tofino Legion. Tickets will be available at the door for $10 with all proceeds going to Tofino Streamkeepers. Help us help keep our watersheds healthy and our fish habitats productive! For more information on this event, projects, courses or volunteering check out our website: www.tofinostreamkeepers.ca or call Lisa at 250.266.1052. On June 18 & 19 Tofino Streamkeepers will be holding a 2 day training course. The Stew will be returning to Cox Bay June 11 & 12. After four successful years, with 90 competitors and 850 visitors last year, and with the flavourful combinations and competition that the local surfers bring to the ‘table’, Rip Curl Canada and a team of eager sponsors are preparing you for another hot helping of savoury Stew action. Check out the live beach entertainment, surfboard and wetsuit demos and activities for kids. The contest will feature 8 categories, including open categories for men, women & children, allowing surfers at all levels & ages to showcase their talent! Post-event celebrations will be kickin’ it live into the night, with an Après Surf Steel Drum Band, Small Town DJ’s, DJ Pump & DJ Illo. With the estimated number of competitors in attendance being close to 100 this year, raise your spoons because it is lining up to be an unforgettable weekend! Adam Buskard has spent many years in Tofino. He welcomes Spring with great enthusiasm after the rainy season. 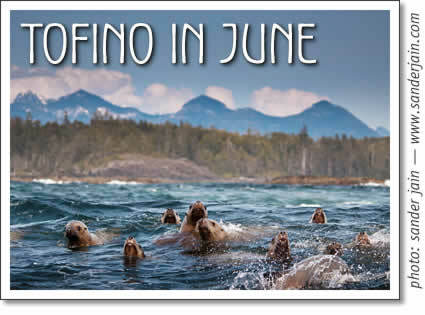 Tofino in June 2011: An overview of what’s happening this month in Tofino, by Adam Buskard for Tofino Time Magazine.